Sharing significant summertime headlines from each of our 10 core member institutions and using tweets to do the job. Bryant alumnus Craig Schlitter has taken another step up the Colorado Rockies’ organizational ladder and it has landed him in his home state of Connecticut. The 2014 NEC Pitcher of the Year, a former 27th Round draft pick, has been promoted to the Eastern League and will compete for the Hartford Yard Goats (Colorado’s AA affiliate). CCSU’s decorated senior swimmer added more impressive experience to her aquatic resume. The 2017 NEC Swimmer of the Year contested the 50m breaststroke and the 100m breaststroke at the USA Swimming National Championships in Indianapolis. She posted two top-50 finishes. The former NEC men’s golf individual champion has played his way into the US Amateur Open Championships. NEC men’s record holder Brendon Rodney, who won a bronze medal for Team Canada at the 2016 Olympic Games in Rio, ran a personal-best 100m time at the @AthleticsCanada Championships and earned a silver medal for the effort. Rodney, the defending Canadian 200m champion, came up 0.06 second shy of a repeat at the 2017 Canadian Track & Field Championships in Ottawa. His 20.02 time made him the runner-up behind Andre De Grasse, whose winning time (19.96) matched the championship record that Rodney clocked last summer. Yup, the men’s 200m finish at #ACTF2017 was close. Three months after locking up the second NEC title of his Mount coaching tenure, Jamion Christian has been invited to stay in Emmitsburg a little longer. John Banaszak and Dusty Baker share a common bond. Robert Morris’ football coach and the Washington Nationals’ manager are going into the US Marine Corps Sports Hall of Fame together. Five years removed from winning the NEC Baseball Tournament MVP award, former Sacred Heart right-handed hurler Troy Scribner is thriving in the professional ranks. The Nutmeg State product, who is the younger brother of former CCSU pitcher and Major Leaguer Evan Scribner, has made the Triple A All-Star Game. Joe Haigh is taking his high-octane offense to the Preseason Women’s National Invitation Tournament. In what will be their 2017-18 season opener, the Red Flash will visit MAC member Toledo on November 10 to tip off play in the 16-team WNIT bracket. 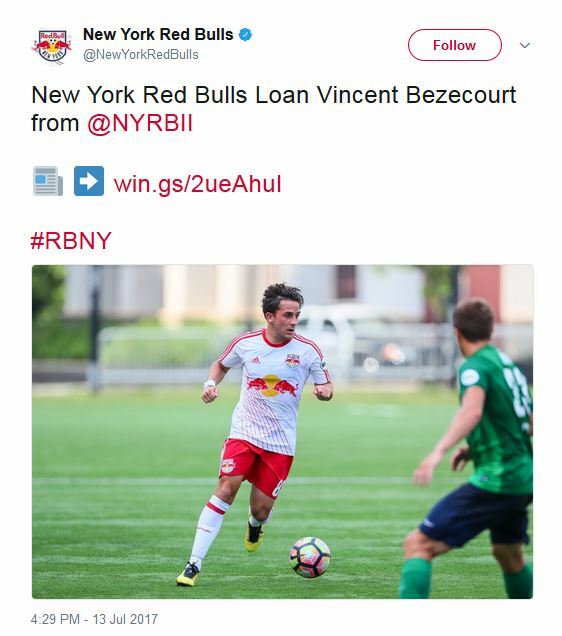 Vincent Bezecourt’s has successfully navigated a path from Brooklyn Heights to the big league. The former Terrier, and NSCAA All-American, has moved up from the United Soccer League to Major League Soccer where he will compete for the New York Red Bulls. It’s official! Wagner and Syracuse will meet again on the gridiron in 2018. The Seahawks, who have faced a FBS opponent during every season since 2012, will face the ACC member for the second time.